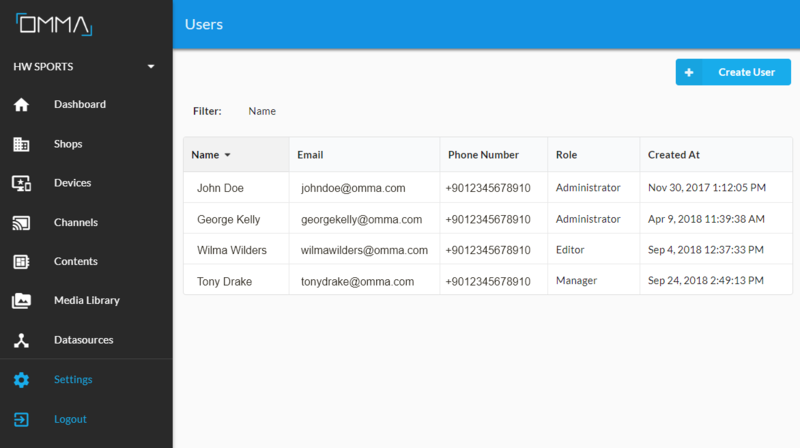 You can create different types of users for OMMA admin panel, and manage their roles and permissions. There are 5 user types. Manager has all of the permissions, and thus, can use all functions of the admin panel. Manager has the authority to approve and make a content go live. Editor has all permissions a manager has, except user creation. Like manager, editor also has the authority to approve and make a content go live. Creating, updating and deleting channels, contents and data sources. Important: A developer neither can create/update/delete devices and shops; nor has the authority to make a content go live. S/he cannot see or create users. Inspector has read-only access to all assets except information about other users in the account.